Woodside, on behalf of the Sunrise Joint Venture (JV), advises that a floating liquefied natural gas (LNG) facility has been unanimously selected as the preferred processing option for Greater Sunrise gas. The Greater Sunrise fields, which include the Sunrise and Troubadour discoveries, are located about 450 km north of Darwin. The fields, which have a total contingent dry gas resource of 5.13 Tcf and 225.9 MMbbls of condensate, are partly located in a Joint Petroleum Development Area (JPDA) administered by the governments of Timor-Leste and Australia. Woodside Chief Executive Officer Don Voelte said that the International Unitisation Agreement (IUA) signed by the governments of Timor-Leste and Australia in February 2007 required the Sunrise JV to develop the Greater Sunrise fields to best commercial advantage consistent with good oilfield practice. “Following an extensive and rigorous commercial and technical evaluation of the various development options available to the Sunrise JV including building onshore processing plants at Darwin and in Timor-Leste, a floating LNG processing facility best satisfies the key development requirements outlined by the IUA,” Mr Voelte said. Mr Voelte said the Sunrise JV participants would continue to work with both the Australian and Timor-Leste authorities to progress the development of the Greater Sunrise fields. The Sunrise JV participants include Woodside (Operator) which has a 33.4% interest, ConocoPhillips (30%), Shell (26.6%) and Osaka Gas (10%). Lao Hamutuk Dili 29 April 2010 The Greater Sunrise oil and gas field in the Timor Sea has been the subject of exploration, controversy, and negotiations since it was first discovered in 1974. In particular, the question of where to liquefy the natural gas -- converting it into LNG which can be shipped to overseas customers -- has been vociferously debated since Indonesia was forced out of Timor-Leste in 1999. After moving ahead in fits and starts, the Sunrise project is now getting closer to reality. This web page will include information and analysis about the project, especially events in 2010. For background and basic information, see the references linked to from the history section below. Over the last few months, the discussion over Greater Sunrise has intensified, with Timor-Leste’s government, other Timorese politicians and NGOs, Woodside, the Australian government and many commentators offering their views. Timor-Leste media have been filled with polemics and misinformation regarding the Greater Sunrise gas field and the LNG plant that will go with it. La'o Hamutuk is a Timorese civil society organization which hopes that this project will give the maximum benefit to the Timorese people. We are concerned that many of the reports misrepresent the reality of the situation, which has economic, legal, technical and environmental aspects, not only politics, and we hope that this web page will help people better understand the issue. In February 2008, La'o Hamutuk published a book Sunrise LNG in Timor-Leste: Dreams, Realities and Challenges, which is on-line in English and Bahasa Indonesia, with a summary in Tetum. The report includes a history of relevant events from 1970 through 2008. Read the full article here. The Australian Embassy Dili, East Timor Media Release: Australian Ambassador 28 April 2010 Media reports about Greater Sunrise development - I am concerned at recent media reports about the development of the Greater Sunrise oil and gas resource. Any suggestion that Australia has threatened Timor-Leste on the issue is incorrect. Australia’s long-standing position is that a decision about development of Greater Sunrise is for the commercial partners to make, consistent with the treaties Australia and Timor-Leste have negotiated. Australia will continue to discuss the management of Timor Sea resources with the Government of Timor-Leste in a consultative manner. Australia is committed to the security and prosperity of Timor-Leste. Hau hakfodak kona ba reportajem nebe fo sai foin dadaun ne’e kona ba dezenvolvimentu mina-rai no gás iha kampu Greater Sunrise. Dehan katak Australia halo ameasa hasoru Timor Leste, ida ne’e sala. Australia nia pozisaun kona ba dezenvolvimentu iha kampu Greater Sunrise ne’e kleur ona, katak sai hanesan desizaun ida ba parseirus de negosius sira atu halo, nebe haktuir tratadu sira nebe halo entre Australia no Timor Leste. Australia sei kontinua konsulta nafatin ho Governu Timor Leste kona ba jestaun rekursus iha Tasi Timor nia laran. Australia iha kompromisu ba Timor Leste nia seguransa no prosperidade. The Embassy wishes to inform American citizens of a change in Timorese visa regulations. Effective March 16, 2010, Americans seeking to enter Timor-Leste at a land border crossing must have received a visa in advance. Visa on arrival at a land border crossing is no longer permitted for Americans and most other nationalities. Americans needing a Timorese visa can attempt to access a list of Timorese diplomatic facilities on the Ministry of Foreign Affairs' website at www.mne.gov.tl. American citizens arriving at Dili airport, however, are still eligible to receive visas upon arrival. Diario Nacional, April 20, 2010 language source: Tetun - The Timorese Operational Commander Superintendent Chief Mateus Fernades has called on the martial arts gangs who conduct their movement at night not to imped the local residents’ freedom. “We thank the residents for their opinion saying that the situation in their area is under control," Fernandes said. Fernandes pledged that the National police will continue undertaking their duty in the field based on the law and order, so that the local residents can conduct their daily activities freely. 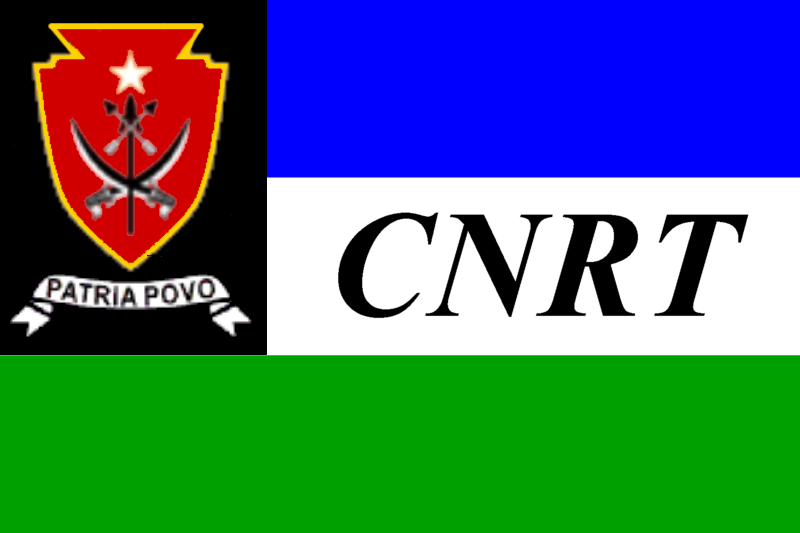 “PNTL will collaborate with the United Nations Police and other institutions to ensure security in the country so that people can freely undertake their daily activities,” Fernandes said. He also called on the martial followers in Bucoli of Baucau district to conduct their movement in a proper manner so that it can not affect people’s activity or freedom. 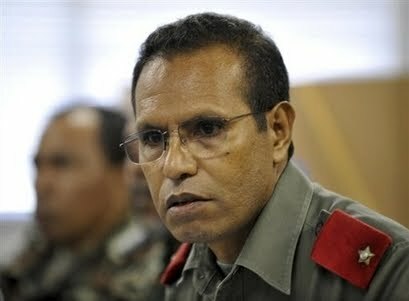 Televizaun Timor-Leste, April 20, 2010 language source: Tetun Dili District Court has reopened the case of shooting at the residence of Timor-Leste’s Defence Force Commander Taur Matan Ruak in May 2006. 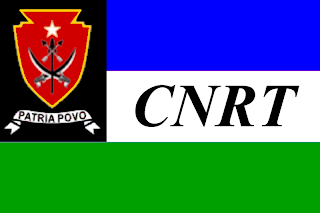 The attack was alleged to be directed by Abilio ‘Mausoko’ Mesquita, Artur Havelar, Arlindo da Costa, and Valente de Araujo who were members of the National Police Force (PNTL). According to Paulo dos Remedios, a lawyer for Abilio Mesquita, the case is reopened because their appeal to the Court of Appeal regarding the case was successful. Dos Remedios said that he appealed against the decision of the court because the court failed to do the defendant’s request to have a visit to the residence of Taur Matan Ruak. “The request was for the court to authorise a visit to the residence of Major General Taur Matan Ruak due to the principle of special diligence, as the right of the defendant based on the Process of Criminal Proceedings Article 252,” said Dos Remedios. He added that in the previous judgment in 2007 and 2008, the court violated this right of defendant, the reason which made the Court of Appeal to over-rule the decision of the Dili District Court. The hearing on Monday was presided over by Judge Joao Paulo and aided by Constancio Basmery and Deolindo de Jesus. In the hearing, the office of public prosecution read the charges against the defendants. On May 25, 2006 the residence of Taur Matan Ruak was under attack from PNTL members following the institutional conflict involving the two security and defence institutions. Taur Matan Ruak, a Brigadier General, was at the Defence Force’s headquarters but his children were in there residence. A team rescued Ruak’s children unharmed but Ruak’s body guards involved in a shoot-out with the attackers. Expropriation is a process through which the State can compel people to sell their property, to use it for public benefit. On 6 April the Government presented Parliament with a draft Expropriation Law as part of a "land package". Committee A is now reviewing the law. In many countries expropriation is a source of conflict and rights violations. Many Timorese people lost their land to forcible expropriation during the Portuguese and Indonesian regimes, and these traumas leave deep scars. When expropriation is perceived to be unfair or arbitrary, communities will resent, rather than welcome, projects of genuine local benefit. La'o Hamutuk and many others believe Timor-Leste needs to approach expropriation carefully. It should only be done rarely, when every alternative is exhausted. The draft law has too few safeguards to prevent the State unfairly taking people's land. The Ministry of Justice did not consult the public on this law before presenting it to Parliament. We hope that Parliament will send this law back to the Ministry of Justice to conduct a meaningful public consultation that can determine what Timorese people believe is a fair process for expropriation. The web page outlines the expropriation process described in the draft law. It also suggests safeguards that could be explored further through a government public consultation process. We welcome further documents, analysis and commentary from all sources. Two weeks ago the government approved and sent to parliament 3 laws that will have a huge impact on the people of Timor-Leste’s land rights. The first of these laws, the Lei de Terras, was the product of much work and debate and 5 months of public consultation. The other two, The Property Fund Law (Lei Fundo Financeiro Imobiliario) and the Expropriation Law (Lei Expropriacoes) were written by law firms and (unlike the Lei de Terras) were not opened for public consultation by the Minister of Justice. They have not yet been translated to Tetun. In particular the Expropriation Law (Lei Expropriacoes) which establishes when and how the state can take peoples’ land will have a very significant impact on our rights and access to land. Expropriation is the process through which the state takes land in order to undertake developments in the public interest (for example to build roads, ports or hospitals). Almost all countries have some sort of process for doing this, however the act of evicting a person, family or a community from their home and taking their land is huge incursion on their rights and should only be allowed to happen in exceptional circumstances where there are no alternatives, and where the development is necessary ‘for the public interest’. The definition of ‘public interest’ during state expropriation of land is one of the world’s most contentious land issues. If we define ‘public interest’ very broadly we give the government huge power to take land. Considering this, in order to prevent conflict and create a law that can contribute to creating peace and strengthening development it is important that there is deep consultation. If we give a wide definition to this concept of public interest we give the state strong powers to take land. In many parts of the world we can see examples of powerful states evicting the population arbitrarily in the name of economic development. Cambodian Law for example states that ‘no person may be deprived of his ownership unless it is in the public interest’ and yet, in Cambodia over 150,000 people live everyday under the threat of eviction for the creation of luxury housing, hotels, shopping malls etc. In a recent case over 4,200 families in Phnom Penh lost their land when they were evicted in order to make way for state sponsored private economic development. What does the draft Expropriation Law say? Timor-Leste’s new Expropriation Law does not give any definition to this concept of ‘public interest’. It gives the government almost no limitations therefore allowing it to determine cases arbitrarily on a political basis what is in the public interest. Under this law the government could decide that clearing communities from their lands in order to give large tracts of land to companies like SAPT or P.T. Salazar is in the public interest. Or that evicting people from their homes in order to allow foreign companies to come and build hotels is also within the public interest. Expropriation of land and people’s homes should never happen arbitrarily. We need a law that establishes not only sufficient compensation but also lays down sufficient protections against unjust, arbitrary, corrupt or forced expropriation of land. We need a law which allows the state to expropriate land only in exceptional circumstances and where no other alternatives exist. We need a law that guarantees the role of the people in decisions and consultations about expropriation. A crucial part of writing appropriate expropriation policies and rules is ensuring that marginal communities and those who are likely to be affected by expropriation are involved in their creation. Without their involvement in the process laws will favour the richer and more powerful groups in society. § This law was written with no consideration of the Timor-Leste context. It does not look at Timor’s historical complex relationship with expropriation, or how the realities of expropriation might affect the nation. We should not forget that conflict in 1975, 1999 and 2006 was all linked to land and the independence of land. § It was written undemocratically with no participation from the people on whom it will most impact. Expropriation of land affects most severely those living in poverty. Special efforts should have been made to ensure the participation of these groups in the creation of these laws. The law should look more specifically at providing protection to vulnerable land groups in Timor-Leste. § It was written in a language that our population cannot understand. § At no point have we been asked how and when we would feel that it would be justified for the state to take our lands. Most importantly, we must ask why the Government is trying to sneak in this law as part of a package of transitional land laws? The Expropriation Law was sent to parliament at the same time as the new Lei de Terras. The Lei de Terras aims to resolve uncertainty over land claims in Timor-Leste, it is the product of significant debate and public consultation. It is very important that we consider these two laws as distinctly separate. 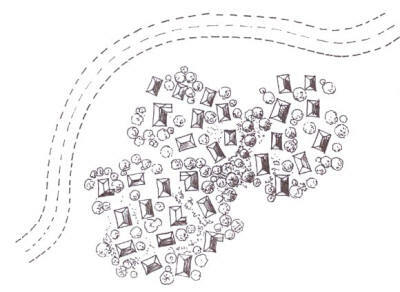 The Lei de Terrasconsultation process which was carried out last year (June 2009 – November 2009) at no stage discussed or consulted with communities on the issue of expropriation. Government representatives have said that expropriation is a very technical issue and that the population of Timor-Leste would not have the capacity to give opinions on these types of issues. This is not only inaccurate, but also seeks to justify the dilution of our rights of participation. Asking people when and how they feel it is justified for the state to take their land is not a complicated question. § A lack of capacity to understand the issues does not negate the duty of government to allow participation in governance and legislative issues. In the case of the Expropriation Law the problem is not that there was insufficient or weak consultation, but that the public was not given any opportunity to access or contribute to the development of this law. 3. Guarantee the role of the public in the creation of future Land Policies and Laws, and in particular guarantee that all laws that will have a large impact on our land rights and access to land will undergo sufficient and substantial consultation. 3. Guarantee their commitment to participatory and democratic approaches to legislation and policy creation. The Expropriation Law was written by Portuguese law firm Miranda. Semana rua liubá governu sira mak approva no haruka ba parliament lei tolu(3) ne’ebe sei fó impaktu bo’ot ba povu Timor-Leste nian direitu ba rai. Lei primeiru, naran Lei de Terras, mak hakerek liu husi servisu no debát barak no liu husi konsultasaun publiku fulan 5. Lei rua seluk, ida kona-ba Fundu Propriedade (Lei Fundo Financeiro Imobiliariu) no ida kona-ba espropriasaun (Lei Expropriacoes)mak hakerek liu husi kompania avogadu sira no Ministra Justisa la loke lei rua ne’e ba konsultasaun publiku, prosesu nebe hanesan ‘lei ba rai’ nian. Lei rua ne’e dezenvolve esklusivu liu no taka ba publiku, no sira seidauk tradus ba lian Tetun. Liuliu Lei kona-ba Expropriasaun ne’ebe establese bainhira no oinsa estadu bele foti povu nian rai mak fó impaktu bo’ot ba ita nian direitu no asesu ba rai. Espropriasaun mak prosesu ida liu husi estadu bele foti rai atu uza ba dezenvolve projetu ruma ba intereses publiku (ezemplu atu harii dalan, porto ka ospital sira). Normalmente nasaun hotu-hotu iha prosesu ida hodi halo ida ne’e. Maske ne’e atu hasai ema, familia ka komunidade ruma husi sira nian fatin ka atu foti sira nia rai mak iha jerál konsidera hanesan aksaun ida ne’ebe amiasa bo’ot ba sira nian direitu. Bele deit hasai ema husi sira nian rai iha kazus exesional, bainhira alternativu la iha, no bainhira dezenvolve projetu mak nesesidade ba intereses publiku. Iha mondu hotu definisaun ba phrase ne’e ‘tuir intereses publiku’ mak assuntu ne’ebe hetan debát bo’ot. Definisaun ne’e bele iha interpretasaun la hanesan entre jerasaun sira nebe kaer ukun. Ho konsiderasaun ne’e mak hakarak husu atu iha debat klean nune bele evita konflitu nomo bele produs lei ida nebe bele ‘kontribui ba hari pas no hametin desenvolvimentu’. Se ita fó definisaun luan liu hodi interpreta katak interese publiku deit ba konseitu ne’e ita fó póde bo’ot ba estadu atu foti rai. Iha nasaun barak ita bele hare’e estadu ho póder bo’ot hasai arbiru povu husi sira nia rai ho naran dezenvolvimentu ekonomiku. Lei Kambozia establese katak ‘la bele hadera ema sira nian direitu ba rai nebe la tuir interese publiku’ maske nune’e iha Kambozia liu ema 150,000 hela loro-loron ho amiasa duni-sai tamba estadu hakarak harii uma luxu, otels no sentru komersial sira. Foin dadaun iha kazu ida estadu mak hasai familia nain 4,200 ne’ebe hela iha Phnom Penh atu fó dalan ba dezenvolvimentu ekonomiku privadu patronisa husi estadu. Ezbozu Lei Espropriasaun establese saida? Timor-Leste nian Lei Espropriasaun foun la fó naran definisaun ida ba konseitu ‘intereses publiku’. Lei fó ba governu póder bo’ot kuaze laiha limitasaun atu halo determina kazu saida kona-ba asuntu rai ho deit base politika interese publiku. Tuir lei ne’e katak governu bele determina atu hasai komunidade husi sira nian rai atu fó rai luan ba kompania hanesan SAPT ka P.T. Salazar mak tuir interese publiku. Estadu bele mos halo desizaun katak halo duni-sai ba ema husi sira nian uma atu husik kompania husi rai liur mai hari otel mak tuir intereses publiku nebe bele dehan atu hari kampo servisu. Oinsa bele harii politika kona-ba espropriasaun ne’ebe justu? Parte bo’ot hakerek politika no lei espropriasaun ne’ebe serve ba kontextu sosial, ekonomia, cultural no politika nian mak asegura katak komunidade kbiit-laek sira no ema ne’ebe ba oin hetan impaktu husi politika espropriasaun sira involve iha prosesu kria politika hirak ne’e. Se sira la involve iha prosesu hari politika sira ne’e, politika hali’is liu ba ema bo’ot no riku ne’ebe bele influensa maka’as liu prosesu. § Lei ida ne’e mak hakerek laiha konsiderasaun ba kontextu Timor-Leste nian? Lei ne’e la hare ba povu Timor sira nian istoria komplexu ho asuntu espropriasaun. Lei la hare oinsa espropriasaun iha tempu ukun rasik an bele impaktu ba nasaun nian. Keta haluha katak konflitu 1975, 1999, 2006 sira ne’e hotu iha ligasaun kona-ba rai no ukun ba rai. § Lei ne’e hakerek ho metodu ida nebe la’os demokratiku nolaho partisipasaun ida husi ema ne’ebe hetan impaktu bo’ot liu? Ema kbiit-laek sira no ema kiak hetan impaktu bo’ot liu bainhira iha espropriasaun. Entaun presiza esforsu spesifiku atu asegura sira nian partisipasaun iha prosesu hari lei no lei ne’e devia hare liu ba protesaun grupu rai kbiit-laek iha Timor-Leste. Oinsa ukun nain sira atu interpreta espektativa populasaun nian wainhira sira sei hetan ‘espropriasaun’ husi Estado? § Lei ne’e mak hakerek iha lian ne’ebe povu sira la bele komprende? § Governu la husu ba povu sira bainhira no oinsa bele justifika atu foti populasaun nia rai. Importante liu, sosiedade sivil sira (Rede ba Rai) presija hetan informasaun husi Governu sira, no Ministra Justisa tamba sa sira koko atu la’o subasubar ho lei ida ne’e?Lei ne’e haruka ba Parlimentu tempu hanesan Lei de Terras? Lei de Terras mak hakerek atu rezolva konfusaun kona-ba se mak nain ba rai iha Timor-Leste, Lei de Terras mak hetan debate no konsiderasaun maka’as liu. Presiza duni rekonyese katak Lei rua sira ne’e mak ho moos ketak-ketak (la bele kahor). Prosesu konsultasaun Lei de Terras ne’ebe halo tinan kotuk nunka temi ka halo diskusaun kona-ba asuntu espropriasaun. § Se ita senti katak konseitu ruma mak komplexu, Governu, sosiedade sivil no komunidade sira presiza hanoin fali ba ita nian stratejia fahe informasaun, eksplika konseitu no halo konsultasaunn kona-ba assuntu lei no rai. § Kuran kapasidade la signifika katak governu iha direitu atu taka prosesu ba publiku. Governu iha nafatin dever atu garante partisipasaun iha assuntu governasaun ba nasaun nian.Problema ho Lei Espropriasaun ne’e la’os katak konsultasaun la sufisiente ka la forsa, problema mak ita la simu oportunidade ida atu asesu Lei ne’e no fó ita nian kontribuisaun iha prosesu desenvolvimentu lei ne’e. 2. Haruka fali ba Ministra Justisa Lei Espropriasaun no husu ba sira atu halo konsultasaun ida ne’ebe klean, demokratiku, no partisipativu ba asuntu importante ne’e. 3. Garante povu sira nian knar ba oin iha prosesu harii lei no politika rai nian no garante katak Lei sira hotu ne’ebe impaktu ba povu sira nia direitu rai sei hetan konsultasaun nebe klean. 3. Garante ita bo’ot sira nian komitmentu ba prosesu kria politka no lejislasaun ne’ebe partisipativu duni no demokratiku. Rede ba Rai mak grupu organizasaun local, nasional no internasional ne’ebe servisu atu proteje direitu ba rai iha Timor-Leste. Ita nian vizaun mak povu Timor-Leste ne’ebe moris nafatin ho direitu no asesu ba rai ne’ebe justu no sustantivel. Husi tinan 2001 ita halo monitorizasaun, peskiza no advokasia kona-ba asuntu rai. Atu hetan informasaun liu kona-ba Rede ba Rai, Lei Espropriasaun ka asuntu rai seluk favor ida kontaktu sekretariadu Rede ba Rai liu husi telemovel +670 7307800. Ministra mak emprega kompania avogadu Portugues Miranda atu hakerek Lei Espropriasaun. Televizaun Timor-Leste, April 27, 2010 language source: Tetun - Secretary General of the Fretilin Party has said Monday (26/4) during a press conference at the Headquarters of the party in Komoro that he does not believe that Xanana Gusmao had accused him saying that he ordered to set fire to the Customs’ Office in 2006 but it was a mere fabrication of the STL. “If it (the statement of Gusmao) happened in 2007, I might have believed it. However if he said so in 2010, he is a liar because he has had all the data about it,” said Alkatiri. Alkatiri made the statement after Suara Timor Lorosae (STL) daily newspaper on Monday published the statement of PM Xanana who had accused Fretilin as being more corrupt than AMP and accused Alkatiri of ordering the burning down of the Customs’ office in Kolmera in 2006. 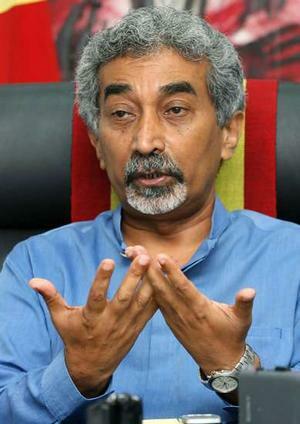 “I don’t believe that Xanana said so but it is fabrication of the STL made with the intention create tensions between Fretilin and CNRT because there is a possibility for the two parties to have a coalition,” said the former Prime Minister who was toppled in 2006. He said Fretilin members are everywhere to attend the consultation of the Prime Minister and his sources said that there was so such statement from Prime Minister Gusmao. “We (Fretilin) follow the process because Fretilin is everywhere,” said Alkatiri. He argued that the document was totally backed up and therefore there was nothing lost about the data of the Customs’ Department. Regarding the consultation of the 2020 National Development Plan, Alkatiri said Gusmao is indeed doing a pre-campaign. He said that consultation should be done by his technical staff but his direct involvement in the process is more than a political campaign. Suara Timor Lorosae, April 26, 2010, language source: Tetun - Prime Minister Xanana Gusmao has said that Timor-Leste has got proposals from Indonesian Telkom and Irish Digicel to compete in the area of telecommunication in the country in order to ‘kill’ the monopoly of Timor Telecom. “We have accepted the proposals from Indonesian Telkom and Irish Digicel to get into Timor-Leste to compete with Timor Telecom,” he said. Gusmao added that in 2009 his government had approved a liberalisation law for the telecommunications sector which gives more opportunities for other telecommunication companies to compete in investing in Timor-Leste. He said that telecommunication is a very important factor in the development of the country. Sub-district Administrator of Iliomar, Abilio Quintao, said that he supports the idea to have more than one telecommunication company in Timor-leste so that they can provide a better service for the people. He added that many people can now afford to buy Alcatel but unable to have contact with their family members in Dili because there is no network. The East Timor national football team pose before their match against Brunei during their Asean Football Federation Suzuki Cup 2008 qualifier at the Olympic national stadium in Phnom Penh October 23, 2008 . After six fruitless years playing international football, FIFA's lowest-ranked nation East Timor are beginning to see the romance of the beautiful game. PHNOM PENH (Reuters) - After six fruitless years playing international football, the world's worst team are beginning to see the romance of the beautiful game. When the rag-tag national side of East Timor drew 2-2 with fellow strugglers Cambodia last week, they clinched the first point they had ever won to stem a seemingly endless run of defeats. FIFA's lowest-ranked nation finally had something to celebrate. "It was the first game we didn't lose -- we're all very proud," said long-serving, long-suffering coach Pedro Almeida, a motorcycle mechanic in the country's sleepy capital Dili. "We are not happy with our world ranking and we are hoping our players will continue to improve," he told Reuters. Almeida says it is no surprise that his team of inexperienced misfits have never won a match. Although aid and investment have trickled into the cash-strapped Southeast Asian nation since it gained full independence in 2002, hardly any has been spent on sport. The country's handful of balding soccer pitches are barely usable and its federation chiefs say it is almost impossible to find opponents for friendly matches. The soldiers, grocers and port workers who make up the national side receive no money or expenses and many struggle to fulfil their international soccer commitments. "We have no resources to keep this team together and we barely have grass to play on," added the 53-year-old Almeida, who has introduced 12 new players in the last month alone. "The squad changes constantly because the players have families and cannot afford time off work. When they are 21 or 22, they have to quit." There are signs of better things to come, however. East Timor were only 10 minutes away from their first win when they conceded a late goal against the Cambodians, while a clumsy own goal denied them a shock draw on their World Cup qualifying debut against Hong Kong a year ago. World governing body FIFA has pledged to improve some of East Timor's rugged playing surfaces by the end of next year and Almeida says the team's confidence is growing fast. Defender Alfredo Esteves, who plays for unfashionable Australian outfit Wollongong FC, is East Timor's only professional player but he believes others will soon follow in his footsteps. "Everyone has seen that East Timor's performance has been improving," said the Portuguese-born Esteves, who reached the peak of his career playing in the United States with the Minnesota Thunder and the New Hampshire Phantoms. "We have a lot of young players and we now feel the future will be better for us. "I believe that we will grow and we will show to other national teams that even East Timor can play football too," added Esteves, who at 32 is the team's most experienced campaigner. The inspirational captain, however, does not have high hopes for the team, who in 2006 reached their highest ranking -- 198th of the 200 competing countries. "My ambition is just to have more games for East Timor to play," he said. With a little help, coach Almeida believes his side can pull away from teams such as the Cook Islands, American Samoa and Montserrat, their long-time friends at the foot of the rankings table. He does not ask for much. For now, a pitch with grass will do. "We cannot see our first win coming in the next few years but we will never quit," he said. "But soon we will get our first good pitch and we hope to have another. That will help our players to develop and represent their country at a much better level." Timor Post, April 26, 2010 language source: Tetun - Deputy Timorese Police Commissary Afonso de Jesus, has said that the National Police Command has planned to open new a recruitment process, but it will happen after the law approving the criteria for recruitment. “We are elaborating the draft law, particularly law about the criteria for the recruitment process,” de Jesus said. De Jesus said that it was possible to postpone the recruitment process until next year if the draft law on the recruitment criteria will not be finished this year. PNTL acknowledge illegal weapons in Ermera Timor Post, April 26, 2010 language source: Tetun - Deputy Timorese Police Commissary Afonso de Jesus has said that the recent information about illegal weapon in Ermera district was true. “You asked me about illegal weapon two days ago and I responded saying that I had no information about illegal weapons in Ermera, but now I have information from our officials in the area that this information is true and that some illegal group have weapon,” Commissary de Jesus said. Commissary de Jesus also called on local residents of Ermera to cooperate with the local police officers and provide clear in formation about this case so the police can take necessary action to respond to this case soon. “We ask for all people of Ermera to give the local police information concretely, so that the police can make a proper plan and strategy to respond to this case,” Commissary de Jesus said. He added that the PNTL commando has deployed a special team of the national Police to the area to collect more clear information about this case, adding that he had no information about illegal weapon in the other twelve districts except Ermera. Timor Post, April 26, 2010 language source: Tetun - The United Nations Community Police has collaborated with Plan International to hold a friendship football match between young men as it was a way of moving their minds to think about conflict. “This match is a strategy to make young people to think about conflict and how they can get close or more friendly with community police in their daily life,” a UN Community Police officer, Azhar Abu Bakar said. He added that Community Police from Malaysia and Singapore had always conducted such matches in order to unite young people, adding that they provide uniforms to the winning team or club. Radio Timor-Leste, April 26, 2010 language source: Tetun - The National Traffic Police, Inspector Antonio da Costa, has said that the Timorese National Police (PNTL) of the traffic department will ban long vehicle from operating during the day loading container starting from April 26 next Monday. “Based on the authorisation letter, starting from April 26th long vehicles can only operate at early morning 1:00 up to 6:00 AM and therefore the traffic police will take strong action to against those long vehicle that breach this rule,” da Costa said. Da Costa said that the Traffic Police will continue conducting civic education to the public by distributing pamphlets and putting up posters at public places so that people can access more information about this case. The Minister for Foreign Affairs takes notice of the so –called “credible sources” being quoted in media reports that continue to be disseminated in the media allegedly from the Office of the Prime Minister or the Secretary of State of the Council of Ministers, without there being a named source. The Minister for Foreign Affairs, as party leader of a political party which is part of the AMP, is fully aware of his ministerial and party responsibilities. * The Minister for Foreign Affairs reaffirms that it is the exclusive competence of H.E. The Prime Minister Kay Rala Xanana Gusmao and the Prime Minister only to resolve all matters in relation to Cabinet members. Global Post Analysis: Tough task to tackle corruption in East Timor The new anti-corruption commission will need to take action ­ and fast ­ in order to justify its existence. By Matt Crook ­ Special to GlobalPost Published: April 18, 2010 08:58 ET - DILI, East Timor ­ Over the past year or so in East Timor, a slew of top officials have been implicated in corruption scandals. The justice minister was charged with influencing government contracts; the finance minister was criticized for allegedly giving jobs to her friends; and one of the country’s deputy prime ministers was accused of misusing power by giving his wife a well-paid U.N. job. The list goes on. The ruling coalition maintains that these allegations are based on half-truths and misinformation, while opposition lawmakers accuse the government of whitewashing the issues. Stuck in the middle are the country’s 1.1 million people, who often don’t know what to think. The tiny nation of East Timor has only been formally independent since 2002 after a savage occupation by the Indonesian army that caused more than 100,000 deaths and in 1999 saw the destruction of much of the country’s infrastructure. Many are hopeful that the country has finally broken its cycle of falling back into strife every two years, as the past 25 months have seen the country's longest period of peace and stability in recent memory. 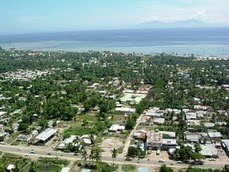 But, as the government plans to up spending more than $5 billion of oil wealth, corruption has become a hot topic in the capital, Dili. The government is under pressure to push on with development in key areas, such as infrastructure and education, while retaining the trust of the people in the face of fiery political bickering and a gaggle of gung-ho local journalists. In an effort to show they are cleaning up their act, the government has established a new Anti-Corruption Commission. The commission will deal solely with corruption cases, which used to fall under the jurisdiction of the Ombudsman for Human Rights. The commission must now achieve concrete results ­ and fast ­ to justify its existence. The stakes are high in the run up to a general election in two years. Unless they see action and closure on the cases they read about in the press, the people of East Timor will be left in the dark. None of the recent corruption allegations have been proven in court and each “scandal” has fizzled out. Sebastiao Ximenes, East Timor’s Ombudsman for Human Rights, said from his office in Dili that he handed over 28 cases of corruption during his first term to the prosecutor general’s office, but not one has made it to court yet. He attributes this oversight to an ill-equipped justice system that is struggling to get through thousands of backlogged cases. “We cannot expect more from this commission if we don’t change or make a new strategy to develop the prosecutor general’s office, in particular how to provide more resources like human resources or maybe financial resources, recruit more prosecutors and provide special training on corruption issues,” he said. The Anti-Corruption Commission must now pick up where Ximenes left off, but it won’t be an easy task. The government has in the past lacked effective oversight and disciplinary measures, as was evident last year when Prime Minister Xanana Gusmao shifted $70 million of unused cash from a heavy oil project over to 774 small infrastructure projects dotted around the country. The projects were dished out with no tenders and money was paid to a body created by Julio Alvaro, head of the Business Forum of East Timor, to be disbursed to contractors. This led to an alleged discrepancy of $3 million and accusations of shoddy work done by contractors, some of which are part-owned by Alvaro. Dinora Grandineira, director of East Timor’s NGO Forum, said it was a “learning experience” for the government, albeit an expensive one. “[U]nplanned, off-budget, unspecified, poorly-overseen small projects cannot substitute for a national infrastructure plan which identifies priority needs and projects and integrates them into [East Timor]’s national requirements,” she said in a statement earlier this month. Mario Carrascalao, East Timor’s other deputy prime minister, defended the prime minister's decision. “The idea of the prime minister was to give a chance to small enterprises in the districts and sub-districts to give them an opportunity to get some money and also to create jobs there,” he said. A government team has been investigating the quality of the projects while the office of the prosecutor general is looking into the missing money. Looking to the future, a lot is riding on this Anti-Corruption Commission, which is supposed to keep the government and civil service in check. Christopher Samson, head of Timorese anti-corruption watchdog LABEH, said education is key. “If we start now teaching our children how to stop corruption, implanting good governance, trying to put anti-corruption in the national curriculum, we will have people who are already a different culture of behavior,” he said. Meanwhile, Deputy Prime Minister Carrascalao has been firing daggers, saying the commission probably won’t even be operational until next year. “I don’t believe this is the real solution. ... Corruption comes from many sources in the government, so we have to know what is wrong in the government. One thing that is wrong is the administration. There are too many holes where people can put their hands,” he said. Samson from LABEH said Carrascalao's stance is counter-productive. “The Anti-Corruption Commission that has the competence to draw the line on the strategy that the nation will use to fight against corruption,” he said. “As a deputy prime minister, the people want to see action that you have put in place, what have you done? People don’t want to hear gossip,” he added. It remains to be seen how effective the commission will be ­ and for the people of East Timor, who are left without answers and without leadership they know they can trust, the unanswered questions continue to pile up. Matt Crook is an English journalist currently based in Dili, East Timor. He has been based in Southeast Asia for five years, and has also reported from Thailand and Indonesia. THE lethal projectile was a rama ambon, a 20cm dart with a barbed, razor-sharp tip. It is the preferred weapon of Dili's gangs, who often coat them in battery acid. It speared deep into Jose da Silva's chest, stopping a millimetre from his heart. Doubling over with pain, he grabbed the wound and held it to stop the bleeding, then staggered to the main road to get a taxi to hospital. A week later, lying on his bed in his small airless bedroom, wincing from the incision which doctors made to remove the dart, he says: "I've told my friends not to get revenge. I want the guy who did it - and I know who he is - to face justice. To be arrested and go to court." But official justice may be slow in coming for da Silva. The police haven't even bothered to interview him, let alone his attacker - something that has become common in East Timor. It's a measure of the power and immunity of the gangs, which many believe now pose a significant threat to the nation's security. On the surface, East Timor appears to be undergoing a miraculous transformation, thanks to its oil and gas industries and the government's decision to expend revenue from the nation's $5-billion petroleum fund on infrastructure and other projects. President José Ramos-Horta recently announced East Timor had experienced 14 per cent economic growth in 2009 - among the highest rates in the world. And where once burnt-out buildings lay smothered in weeds, a modern city is emerging. A three-storey shopping mall is half-built; a beachside resort is planned; fleets of new government cars hog the streets; and on weekends businessmen take the afternoon air in their European convertibles. But the development picture is misleading. East Timor is ranked 162nd out of 182 countries in the United Nations' human development index. AusAID, the Australian Government's overseas aid program, says it is estimated that almost half of East Timor's 1 million people live on less than $US1 a day; half are illiterate and more than 40 per cent of young males are unemployed, offering the gangs plenty of recruitment opportunities. Even on the new construction sites, freshly painted gang signs are daubed - demonic skulls and murals, such as the distinctive four-pointed symbol that designates the PSHT, or Persaudaraan Setia Hati Terate ("Brotherhood of the Faithful Heart of the Lotus Flower"). Formed during Portuguese and Indonesian occupation, the 15 or so major gangs have an estimated membership of around 90,000 and boast names such as Commando or Korka. Australian-based gang expert James Scambary, who compiled a Who's Who of the groups for AusAID in 2006, says many were originally established as a form of resistance to Indonesian rule; others were set up by the Indonesian military as a means to impose order. TO view Dili therough a gang member's eyes is like looking through night-vision goggles: suddenly you see the invisible markers and boundaries that etch out each gang's territory. "See the old fence over there? That is their territory, and the other boundary is the dirt road over here," says Lucio Borgas, signalling the stamping grounds of his enemies, the 7-7 gang, who are fighting for control of the Bairo Pite district. By day Borgas is at college, studying public administration, but after hours he is a member of the PSHT. He trains regularly with the gang, practising their special brand of martial arts, which incorporates Portuguese and Indonesian styles of unarmed combat. The groups imply that their training is primarily for recreational purposes, but the bonds go much deeper. In a dangerous city, gang membership offers security. "I joined in Indonesian times for the sport, but there is more," says Borgas. "There is a doctrine we must follow, and we help one another." Enhanced by the absence of an effective police and judicial system, by corruption, political ambition and tribal or family loyalties, the gangs' power has long been on violent display, notably during 2006, when the country was on the brink of civil war, and during the 2007 election. Few Timorese can forget the images of hundreds of youths battling on Dili's streets with samurai swords, firing rama ambon darts at each other and burning down rivals' houses. Unable or unwilling to eradicate them, the government has instead recognised many of the gangs as legitimate martial arts groups, which take part in official competitions. But their activities often go well beyond sport. The gangs have political connections and access to weapons; many of their leaders are linked to serious criminal activity. Others foster cult-like beliefs and practices that appear at odds with the country's Catholic tradition; one gang has latched on to an 11-year-old boy whom they represent as the son of Christ, according to media reports. Scambary says the gangs represent "a huge problem" that is spreading across the country. "Conflict is breaking out all over Dili in about eight areas," he says. "Not all is gang-related, but there seems to be a new rivalry between PSHT and [another gang] Kera Sakti." 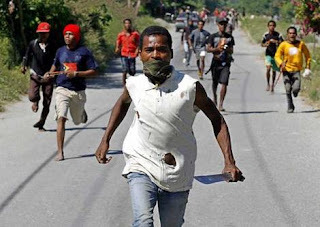 Scambary warns that if nothing is done, the gangs will become institutionalised, and East Timor will go the way of Papua New Guinea or Indonesia, with gangs ever more closely tied to political parties that use them as rent-a-crowd thugs. "Already, you see leaders from some of the gangs in 2006 have now got business contracts," he says. In 2007, the United Nations Integrated Mission in Timor Leste (UNMIT) set up a task force comprising a wide range of stakeholders including the UN, the local police and military to deal with the gangs. When efforts at mediation failed, the task force raided the headquarters of PSHT, arresting its leader and 47 other members and seizing a variety of home-made weapons. For the Dili locals who live among these groups, they have become a sometimes dangerous but depressingly normal feature of the country's landscape, now intertwined with the concept of traditional justice and rights, and vigilantism. Near Comoro, in the city's west, Father Pankras's Catholic Church stands on the front line between some of the most feared gangs in Dili. He says the gangs have been empowered by the authorities' failure to enforce the law. This has led to gangs being called in to resolve the many land disputes in the country, to conduct revenge attacks, and to settle family feuds or clan disputes. "In 2006, some people were killed and it has not been resolved; and families of those that have been killed will take revenge," Pankras says. "In 1999, the Indonesians abandoned a lot of houses when they left. The problem is, people went and occupied the houses and then [during the riots] in 2006, people left their houses and moved to IDP [refugee] camps; when they came back the house was occupied. It's the root of all the problems," he says. "It's very difficult for us to resolve the problems in the community. Today they seem resolved, but tomorrow they are back again." Pankras says the gangs are allied with significant politicians. "When political leaders have a big argument, this is picked up at the level of the martial arts groups and they fight on their behalf," he says. "I can't say who is paying them to fight, but martial arts groups have the link to the politicians and the politicians have the link to the martial arts groups." Aniceto Neves, whose NGO works with gang members to try to encourage non-violent resolution of their disputes, agrees. "Right now there is no justice. Who should be responsible for this violence or attack, the police do not find out. They do not arrest anybody. Both sides feel injustice," he says. He cites a murder where a gang member from PSHT was killed by one from Kera Sakti, but the killing was related to a land dispute in Baucau, on the other side of the country. "They wear the uniform of the martial arts gang to do the killing," he says. "The police don't catch anybody. It's very hard for the UNPOL [UN police] to do these cases, as only the Timorese police know how to get information." Following the UN police as they patrol through eastern Dili gives a sense of the difficulty of monitoring gang violence. Blue lights flashing, hazard lights on, a small group of four-wheel-drives weaves its way through the darkened streets. Locals smile to see the convoy. "They often do this. There was some trouble, but it was way over there," says a local. Another afternoon, the gangs return to Aimutin, where da Silva was wounded. According to locals they block the road and the East Timorese police are called. The rapid response unit arrives but, like ghosts, the gangsters melt back into the back alleys and the police walk pointlessly among the silent shacks for about an hour before leaving empty-handed. "No, it is nothing," says one officer, asked if it was gang-related. His dismissive attitude is explained a few days later, when our photographer arrives to document a PSHT gang martial arts session (pictured above). Dressed all in black to avoid detection by the UN patrols, the gangsters freeze into invisibility as the police car's spotlight sweeps across their training ground. Some of the participants refuse to have their faces photographed. The reason? They are serving police officers. An UNPOL spokesman says later that police membership of martial arts groups is not an issue as long as the officers follow the local police code of conduct. As the corrupt links between gangs, politicians and police solidify, the prospect of a peaceful, settled society developing in East Timor seems to recede. When the UN leaves, it will require "a very strong dictator to stop the gangs", says Father Pankras. "If this problem is not dealt with, the people will live in instability and the nation will be unstable." When dictators are seen as the answer, the battle for stability may already be lost.